Louisburg freshman Rain Pugh takes the hand-off from senior Jordon Leach during the 4×100-meter relay Thursday at the Paola Invitational. PAOLA – When Louisburg junior Sydni Keagle crossed the finish line of the 100-meter hurdles, she saw the rest of the competition behind her. On Thursday at the Paola Invitational, Keagle won the event with a time of 16.56 seconds to get her first gold medal on the day. There would be a couple more that went her way. 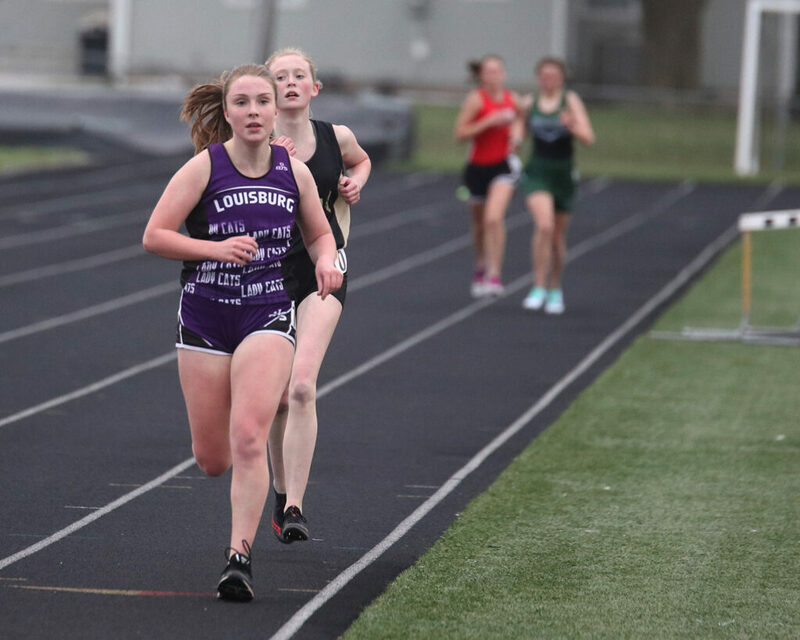 Keagle was a part of the 4×100- and 4×400-meter relay teams that also won gold and helped the Lady Cats to a fourth-place team finish in Paola. Louisburg recorded 83 points, just five points behind third-place Spring Hill. Paola won the girls team title with 145 points and Lamar (Mo.) was second with 116. On the 4×100 relay, Keagle teamed with Jordon Leach, Rain Pugh and Carlee Gassman to win in 52.48 seconds. Gassman, Keagle, Pugh and Delaney Wright blew away the competition in the 4×400 relay as they finished first in 4 minutes and 22 seconds and won by five seconds. Wright finished her outing with four medals overall, which was her second four-medal performance in a week. 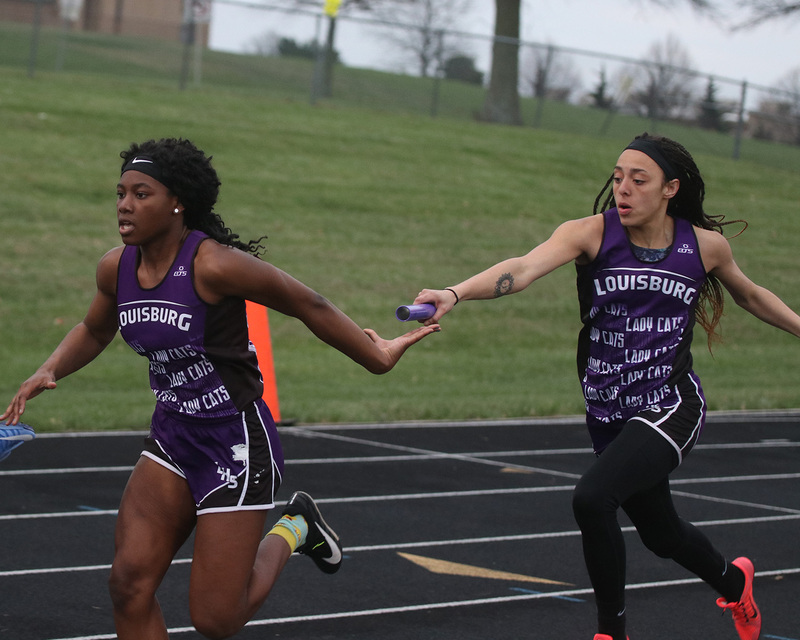 The Louisburg freshman finished runner-up in the long jump with a mark of 16 feet, 11.75 inches and was also second in the 400-meter dash (1:03) and third in the 200 dash (27.28). Gassman, a junior, also finished the day with four medals as she was runner-up in the 300-meter hurdles in 49.28 seconds. She also took third in the long jump with a mark 16-2.5, along with her two performances on the relays. Junior Avery Graham also earned a medal for the Lady Cats as she took third in the pole vault and tied a personal record in the process with a clearance of 9-6. Sophomore Shelby Grandon was other lone point-getter in the field events as she took seventh in the high jump at 4-6. Louisburg senior Shaylor Whitham leads a pack of runners Thursday during the Paola Invitational. Along with their performances in the relays, Leach and Pugh both scored points in the 100 dash as they finished fifth and sixth, respectively. Senior Shaylor Whitham also helped the Lady Cats in the distance races as she took eighth in the 800-meter run in 2:49. Louisburg returns to action tomorrow when it travels to the Anderson County Invitational. Events are set to begin at 3:30 p.m.